Cats with nervous twitches often display enlarged pupils as well. Your feline friend just came racing through the room being chased by an imaginary pursuant, only to stop dead in his tracks, turn around and bite at the top of his tail. You're thinking: What is wrong with that cat? It's a good question, with a potentially neurological answer. The veterinary term for nervous twitching in a cat -- particularly along his spine -- is "feline hyperesthesia syndrome." Purely Pets says it's more commonly called "rolling skin syndrome," because of its similarity to a seizure as the cat twitches during an episode. Veterinary Partner expands on the twitching description by explaining that the cat's body jerks around suddenly, with his tail moving far more than usual. This is because the cat's nervous and neuromuscular systems are affected by this psychomotor epilepsy, according to PetMD. Symptoms of feline hyperesthesia syndrome can occur at any age and can develop within any breed, according to PetMD. For reasons veterinary researchers have yet to identify, this rare syndrome does seem to afflict purebreeds of Abyssinian, Burmese, Himalayan and Siamese bloodlines more frequently than other felines. 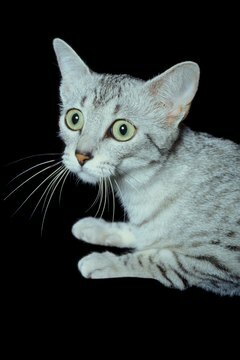 The behaviors by cats experiencing feline hyperesthesia syndrome often seem bizarre or schizophrenic, Pet Place says. The disorder's clinical symptoms can be quite stressful to the cat. Pet Place includes these symptoms: sudden bouts of bizarre hyperactive of aggressive behavior, frantic self-directed grooming along the flank or tail, large pupils or a strange look in the eyes, tail swishing, tail chasing, skin rippling, loud crying-like meows and extreme sensitivity to touch. To humans, cats with this disorder often appear to be hallucinating. People see the cat displaying odd behavior, such as trying to follow the movement of an object that really isn't there, or appearing to be running from an unseen adversary, according to Pet Place. PetMD explains that cats might act normally between episodes, which can last anywhere from just a few seconds to several minutes. The symptoms of this disorder mimic those of other medical conditions such as thyroid gland overactivity, brain infections, brain trauma, brain tumors, some poisonings such as lead or strychnine, heavy parasitic infestations of the skin, nutritional deficits and severe allergy, according to Pet Place. A physical examination alone won't narrow the diagnosis to this disorder. A thorough veterinarian will want to do a series of blood work, a neurological exam and spinal radiographs to verify that the cat indeed is afflicted by feline hyperesthesia syndrome. There is some speculation within the veterinary community that stress is often the trigger for a nervous twitching episode, although this isn't yet medically proven. Nervous or hyperactive cats tend to be a greater risk for developing this disorder, PetMD says. As some liken it to the feline version of obsessive compulsive disorder, Pet Place indicates, some veterinarians prescribe anti-seizure or anti-anxiety medications such as kitty prozac. Pet Place recommends engaging an affected cat in "predatory play" once daily to allow him to blow off steam.